This is the last chance of the year to connect with over 100 companies and organizations that will be here in search of talented UO students and alumni! 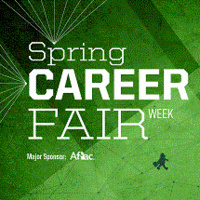 Polish up your resume and join us in the EMU Ballroom between noon and 4:00pm! This is the main-show to a three day Career Fair event (Pre-fair event, Fair, Interview Day). We host 90-plus companies for 4 hours in the EMU Ballroom. These companies and looking to hire students for career-type positions, and internships. The fair is open to all students. The environment is similar to a trade-show, colorful, loud and perhaps overwhelming. The connections can be very valuable.